Art has been with PCJ since 2009 – read below about his first album with us (which was his second solo CD) and here today, nearly 2016, Art has once again, done it! 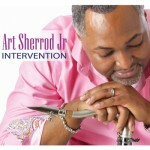 When you take a smooth jazz approach to some of gospel music’s greatest songs, the result is saxman Art Sherrod Jr’s newest CD project titled Intervention, which also features the soulful sound of Incognito’s lead vocalist, Maysa Leak, on a very funky arrangement of Edwin Hawkins’ Oh Happy Day. This project has 13 spiritually enriched tracks that highlight Art’s roots in Gospel, Jazz, R&B and Funk. By no means is Intervention your ordinary gospel jazz project as it features some untraditional songs like Frankie Beverly’s I Wanna Thank You and Sam Cooke’s A Change Gonna Come in addition to some traditional gospel songs like It Is Well, He Looked Beyond My Faults, My Soul Has Been Anchored and a funky horn section infused arrangement of Walter Hawkins’ Going Up Yonder. The contemporary side of Art is revealed as his interprets Vashawn Mitchell’s Nobody Greater and William McDowell’s I Give Myself Away, Chris Tomlin’s How Great is Our God featuring guitarist Alan Scott, How Excellent featuring world renowned bass guitarist, David Dyson and Donnie McClurken’s mega hit Stand. Make no mistake about it, Intervention appeals to all audiences so you will not be disappointed. Art Sherrod Jr truly poured his heart and soul into this one. Sherrod demonstrates in his new release that he really knows how to shape a myriad of moods, from his sultry Thinking Of You, to the funky Smooth Grove and covering a silky rendition of Earth, Wind and Fire’s, That’s the Way of the World. Each track is an expression of Art’s heartfelt voice on soprano, alto and tenor saxophones as he creates rambunctious riffs, soulful sounds, and gorgeous grooves. “I enjoy doing music,” says Art, “because it allows me to communicate with people physically and emotionally and to help them through tough times to keep a positive point of view.” Sherrod’s method of communication can be heard through his music as he makes us dance in east coast style on East Coast Steppin, reflect on our lives in Everything Will Be Alright and get us back on our feet in times of trouble on the classic Donnie McClurkin gospel tune, We Fall Down.